The life of an elephant in entertainment is misery. This Easter, pledge not to contribute to elephant abuse. After being torn away from their mothers as babies, elephants endure years of cruelty — begging on busy streets, performing tricks in shows and later giving rides for hours on end, weighed down by tourist after tourist. To make them accept rides and other human contact, they are restrained, starved and beaten into submission in a brutal training process known as 'the crush'. In camps they are chained up and isolated from their natural social groups without proper nutrition or veterinary care, and controlled with sharp bull hooks that cause serious injuries and infections. Trauma from this abuse can last for a lifetime. Such exploitation is prominent in Asia but is now spreading throughout southern Africa. Most tourists don't know about the intense physical and psychological pain elephants in entertainment suffer. They ride elephants or visit elephant attractions — particularly during the Easter holidays — because they love these beautiful animals. With your help, World Animal Protection is working with tour operators to stop offering elephant rides and shows, and promote elephant-friendly tourism instead. So many elephants still desperately need your help. When the demand ends, so will the abuse. 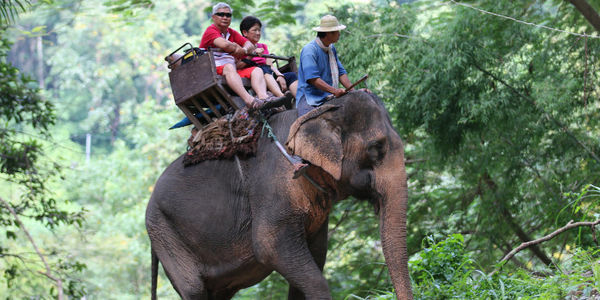 Sign this action to tell the tourism industry you won't stand for elephant cruelty. Pledge to not ride an elephant during the Easter holidays.